Chef Paul Virant, of the restaurant Vie in suburban Western Springs, builds his menus on locally sourced produce from family farms. His exacting sense of how to combine the Midwest's raw materials into finely crafted dishes reflecting the seasons has earned him national honors from top food organizations and publications. Meanwhile, elsewhere in Chicagoland, Robert Nava roasts turkeys himself for real hot turkey sandwiches at The Depot American Diner, on the border between Chicago and Cicero. Deta Lekic, a trim grandmother and the owner of a tiny Montenegrin restaurant bearing her name just steps from the north edge of the city, is a flurry of activity as she rolls out flaky spiraled bureks stuffed with fresh potatoes, spinach and cheese. Another grandmother, Clementina Flores, labors in the back of Sol de Mexico on the west side, stirring pots of complex, spicy mole made from recipes in her family for generations. While many blocks south, behind bulletproof glass, Mack Sevier tends a smoker full of rib tips and sage-flavored hot links at Uncle John's BBQ, turning them obsessively to ensure they reach the perfect point of savory smokiness and flavor. Most awards in the food world draw an obvious distinction between fine dining chefs and everyone else who cooks for a living. But not the LTHForum Great Neighborhood Restaurant awards, which honor restaurants of every kind and price level-- from fine dining to dives and drive-throughs-- where the commitment to quality is palpable and the hand of a dedicated cook with a vision of what their food should be is evident in every bite. Being noticed by LTHForum's savvy citizen food scouts can lead to attention throughout the broader food world. After LTHForum readers showered attention and an award on an obscure pizza place in Morton Grove, Burt's, its classic deep dish was chosen to symbolize Chicago cuisine on the cover of the October 2007 issue of Saveur magazine. But it doesn't take outside publicity to draw attention to the Great Neighborhood Restaurants-- over 4000 people have downloaded the site's pocket guide PDF listing all the restaurants with phone and address, for use while traveling all over the city. And we do mean all over the city—this year's list makes a particular point of identifying fine independent restaurants in the supposedly chain-dominated suburbs, from an outstanding hamburger spot in Des Plaines (Paradise Pup) to a Yucatecan cantina in Cicero (Xni-Pec) to an artisanal woodfired pizza place in the vacation community of Michiana Shores (Stop 50)—oh, and a little place called Vie in Western Springs, too. The 23 new restaurants honored are listed by type of cuisine below, with a link to the thread in which the restaurant was nominated by an LTHForum user. For the complete list of all 88 LTHForum Great Neighborhood Restaurants, go here. The Depot American Diner-- American diner classics beautifully made from scratch, no shortcuts, in a revived old diner space on the Chicago-Cicero border. Fredhots & Fries-- The enthusiastic owner of this Glenview hot dog stand goes beyond the usual red hots for everything from reindeer sausages to homemade aiolis to dip your frites in. Kuma's Corner-- Avondale standout among Chicago's many pub & grub spots, thanks to imaginative burgers, a serious beer list focused on regional brewers, and a surprisingly welcoming tattooed-and-pierced vibe. Paradise Pup-- Fans line up at this tiny spot opposite a forest preserve in Des Plaines for fresh-ground burgers full of smoky grilled flavor. Patty's Diner-- Ramshackle but lovable Skokie diner run by a female grill cook and her waitress sisters, focused on hearty breakfasts and sandwiches. Vie-- A Blackbird-alum chef with a strong commitment to regional and seasonal flavors brings a downtown foodie outlook to suburban Western Springs. Wiener... and Still Champion-- First-class dogs, grilled burgers and freshcut fries, and hand-dipped corndogs are the highlights of this Evanston stand. Maria's Bakery (Il Mulino)-- Authentic Italian sweets and snacks, plus a lively street cafe atmosphere, in Highwood. Old-Fashioned Doughnuts-- The anchor of its little-visited Roseland neighborhood on the southeast side, this place cranks out fresh doughnuts and breathtakingly rich apple fritters. Pasticceria Natalina-- Andersonville bakery turning out magically light and delicate versions of Sicilian and Italian specialties such as sfogliatelle. Smoque-- An instant hit in its underserved Old Irving Park neighborhood, offering smoky brisket, ribs, pulled pork and good sides in an easygoing atmosphere. Uncle John's BBQ-- The former pitman at GNR honoree Barbara Ann's serves up delectable rib tips and hot links with a hint of sage at this South Side BBQ hut. Sun Wah BBQ-- Roasted duck, chicken and pork are the stars on display in the window at this Argyle Street Chinese hole in the wall. Deta's Cafe-- Homey and incredibly welcoming one-woman restaurant dishing up freshly made Montenegrin bureks and soup near the Evanston border. Healthy Food-- Believed to be the oldest surviving Lithuanian restaurant in the world, a charming slice of old ethnic Chicago serving up beyond-hearty food in Bridgeport. Mario's Italian Lemonade-- Legendary Taylor Street Italian ice stand (opposite GNR honoree Al's) provides one of summertime Chicago's most vibrant street scenes. Khan B.B.Q.-- Devon Avenue Pakistani restaurant offers grilled meats which sizzle with charcoal flavor and pungent eastern spices. La Casa de Isaac-- A splash of Mexican sun and soul on the Highland Park/Highwood restaurant row, though don't go Friday nights-- the restaurant-veteran brothers who own it keep the Jewish sabbath (though not strict kosher). La Pasadita (east side of Ashland location)-- Late night revelers from Wicker Park revere this burrito shop (not to be confused with two siblings of the same name within the same block) for top-notch steak tacos and burritos. Sol de Mexico-- Mexican sitdown restaurant in the west side Craigin neighborhood, renowned for its complex moles, from yet another branch of the Bahena family. Xni-Pec-- The area's first Yucatecan restaurant offers homemade seafood and meat dishes and warm service in Cicero. Coalfire Pizza Oven-- A genuine coal-fired oven is responsible for the tasty char on Italian and New Haven-style thin crust pizzas at this Grand Avenue newcomer. Stop 50 Woodfired Pizza-- Authentic Neapolitan-style pizza, topped with homegrown herbs, in the Chicago vacation-home community of Michiana Shores, Indiana. Chicago is a city of great neighborhoods, made distinctive by history, ethnic mix, and vibrant street life and culture. The Great Neighborhood Restaurant awards honor restaurants all over the Chicagoland area which contribute to their neighborhoods' and the city's character by offering outstanding food, an authentic experience of their ethnic culture, and/or a welcoming (or in some cases, belovedly cranky) atmosphere for guests. In a world of generic dining experiences, these are the ones we remember. 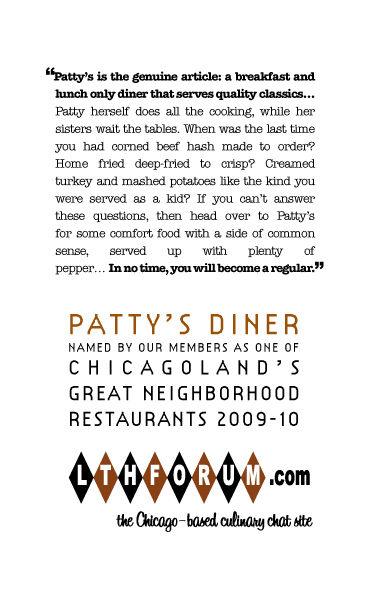 Restaurants are nominated by registered members of LTHForum.com, the Chicago-based culinary chat site, and ratified by a group including the moderators of the board, based on the degree of discussion and community-wide enthusiasm evidenced on the site. Each restaurant receives a certificate similar to the one shown above, highlighting (in quotes from the board) some of what makes it special-- and in many cases, recommending specific dishes to try. Thanks to the volunteers who do a lot of work for the GNRs - including Ramon, SteveZ, Ronnie Suburban, Flip, GWiv, and Mike G. Special thanks to the moderators and members of LTHForum whose contributions, support and, guidance make the GNRs what they are. LTHForum is a chat board based in Chicago and devoted primarily to exploring this great food city, but with discussions ranging worldwide and on every subject relating to food. With over 4000 registered members and some 150,000 posts (the equivalent to a couple of long shelves of books, fortunately searchable! ), it's by far the widest-ranging and most learned source for information on Chicago's cuisine scene. Membership is free and open to all who are willing to share what they know-- and taste. I've updated the Google Maps page to include this year's winners.